Walnut was introduced to England circa 1650 and was popular through the early 18th-century, when mahogany became the preferred choice of cabinetmakers. By the early 18th-century (circa 1720) England had a large trade deficit with Scandinavia mainly as a result of imported timbers for shipbuilding, particularly softwoods. The British government was obliged to address the situation and thus removed import duty from goods imported from “The New World.” This included mahogany from the Spanish West Indies as well as imports from Jamaica, an English island. As a result of international trade - in particular the Far East trade - new and more exotic timbers arrived in England beginning in the mid-18th century. Satinwood came from the East and the West Indies, while rosewoods, kingwood, and tulipwood came from the East. By the late 18th century mahogany became cheap enough to be used not only for the external work, but also for the carcass construction. By the 1850s walnut returned as a popular cabinet timber both in solid and veneered form. Victorian walnut veneer is often much thinner than early-18th-century veneer, as it was cut by machine and not by hand. Veneering was first used in the second half of the 17th century (1650–1700). Objects should be used for the purpose for which they are intended. Chairs should not be tilted back or stood on. Drawers should not be overloaded, and they should be opened with both handles simultaneously–otherwise the drawer becomes twisted in the carcass. When using a ballpoint pen, always protect the table or writing surface by placing some padding under the paper. Ornaments should not be placed directly on surfaces without a layer of protective covering; for example, felt pads. Waxed furniture should be dusted weekly. Alternatively, a light coat of beeswax polish may be applied two or three times a year and then buffed. Polished French furniture should be dusted regularly and given a firm rub with a clean soft rag every three months. No other polishing is necessary. Chairs should be lifted by the seat rails, not by the crest rails or the arms. Chests of drawers should be lifted from the base of the carcass, not from under the rim of the top. Marble tops should always be removed from furniture before the item is moved. The marble should be carried in a vertical position, never horizontally. Bachelor Chest - A small straight front chest of drawers with a fold-over top. The name derives from bachelors having small sets of rooms where limited space allowed the fold-over top to be used for writing. Blind Door - The doors of a bureau cabinet that has wooden panels and not mirror plates. Bobbin Turned - Sections of turning, used on tables and chairs, that are ball- or bobbin-shaped. Bole - A clay in liquid form that can be used over gesso before gilding. Bole can vary in color from red to yellow to gray. Bonheur du Jour - A small late-18th-century ladies' writing table, often with a superstructure fitted with drawers. Boulle Work - A process of inlay that derives from a technique perfected by the Parisian cabinetmaker Andre Charles Boulle (1642-1732). 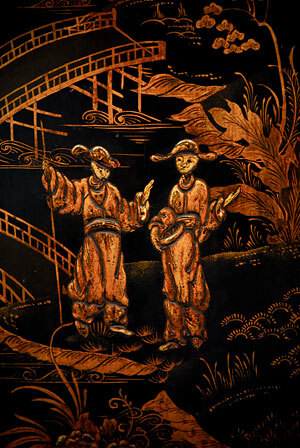 This decoration is a form of marquetry in brass and tortoiseshell or horn. The patterns are cut out of the two materials previously joined together in one operation. Earliest examples date from around 1680 in France. Very little Boulle was made in England; however, many reproductions of this type of work were made in 19th-century France. Generally speaking, ormolu mounts are associated with Boulle work. Bunfoot - As the name implies, a foot in the shape of a ball or bun. Originally of Dutch or German origin, its use spread to England in the late 17th century. Bunfeet are still used today as replacement feet, primarily on chests, either period or reproduction. Cabriole Leg - A form of chair leg or table leg that appeared in England from France in the early 18th century. It is in the shape of a long slow “S”, the outward curve of the knee sometimes decorated. Many of the early examples ended in stylized goat feet, with later examples ending in pad feet, slipper feet, or claw and ball feet. Candleslides - Small rectangular wooden slides found below the mirror or blind doors of bureau cabinets. Candlesticks placed on these slides provided light for working and extra reflected light into the room. Canted - A right-angle corner that has been cut off. Canted corners are often fluted. Cheval Mirror - A freestanding adjustable mirror standing on a four-legged frame. The mirrors, which were first known as “horse dressing glasses,” first became possible in the late 18th century when technical advances allowed the casting of single plates of glass six feet in length so that it was possible for a mirror to reflect the full height of a person standing close to the mirror. The French gave the name “cheval,” their word for horse, to this type mirror. Commode - A French term used to describe an important piece of cabinet furniture with drawers made to go against the wall. The commode was first seen in England during the reign of George II and illustrated in the Director in the mid-18th century. Commodes that were japanned, inlaid, and painted were a feature of late Georgian furniture. Crossbanding - A decorative treatment to the main veneer. The banding is laid with the grain, at right angles to the main veneer. Originally used to protect the expressive main veneer, it later became a decorative device. Drop-in Seat - A padded seat upholstered with horsehair (17th and 18th centuries) and overlaid with hessian and a final cover. The wooden framework that forms the base of the seat has webbing nailed across it. The seat pad then rests on strips of wood fitted to the inside seat rails of the chair. Feather Banding - A decorative edge on a plain veneer. Often used with a crossbanding, the narrow veneers are laid in the form of arrow feathers, or chevrons. Finial - Normally a turned tapered spire found on the top of bureau cabinets. Placed at the front corners, they are often made of the predominant timber and lathe-turned. 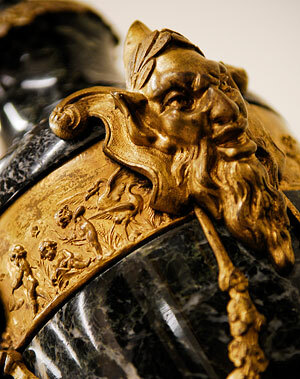 Other examples can be found that are carved and gilded. Gesso - A preparation of chalk worked into a paste with a binder and used as priming before gilding wood to be used in furniture or other decorative work. Giltwood - A soft wood, normally carved or decorated, that is covered with thin gold leaf. Japanning - The European imitation of oriental lacquer. Gesso is used to create raised surfaces overlaid with shellac. Joint Stool - A stool formed with parts that are joined together with mortise and tenon joints. The plank top and joints are held in place with pegs. The legs are turned on a lathe. Kettle Stand - A small circular or square table for holding a teakettle or hot-water urn. Lacquer - The sap from the Rhus verniciflua tree, which is collected like rubber and purified. Color is added, and when dry the wood is waterproof and can be carved. Library Chair - Also called a "Gainsborough". Easy chairs with square padded backs and padded arms and seats. The arm supports and legs are in polished wood. Lyre End - The support for a sofa or writing table of the Regency period in the form of a classical stringed instrument. Mahogany - (Swietenia mahogani) A hard durable wood with a close straight grain, originally from the Spanish West Indies and later from Honduras. The color ranges from light red to dark brown and can be nearly black. It became popular circa 1720. 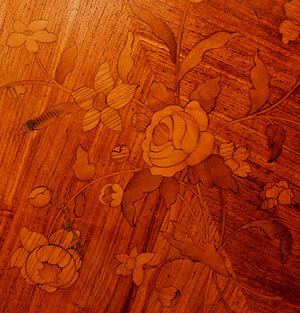 Marquetry - The process of veneering with shapes, often scrolls, leaves, flowers, birds, and insects. This process was perfected by Dutch and German craftsmen and became popular in England in the middle of the 17th century, reaching its height during the reign of William and Mary throughout the 18th and 19th centuries. Mortise and Tenon - A joint in which the projecting tongue (tenon) is inserted into a rectangular cavity (mortice) and held in place by pegs. Moulded-Front Chest - Influenced by the Dutch, these chests have sections of moulding applied to the front, often in geometric shapes. Needlework or Needlepoint - Made with cotton, wool, or silk thread. The pattern is drawn onto a canvas backing and the threads drawn up and through the canvas and the reverse. Oyster Veneers - Small branches are cut across the grain to produce roundels of veneer, which are laid in patterns often outlined with boxwood stringing. Parcel Gilt - Gilded decoration used in conjunction with plain timber; that is, part gilded. Parquetry - Small sections of square or rectangular pieces of veneer, such as parquet flooring. Patera - Paterae (plural), are round or oval inlaid or overlaid panels of classical origin, often made of various colored carved or painted timbers. Patination - The effect of waxing and handling on furniture. A rich, mellow, deep shine that is found and valued on antique furniture. DO NOT REMOVE IT. Pembroke Table - A small table of rectangular or rounded form. Usually with two flaps above a drawer, the table is supported on turned tapered or square tapered legs, often on castors. Pier Table - A semicircular or rectangular table that is the height of the chair rail placed on the pier wall between two windows. Refectory Table - A dining table with the top made of sawn planks. The legs are normally turned on a lathe and often carved. Robert Adam - 1728–1792. Born in Fife, Scotland, he was influenced by his travels abroad and became a leading architect and designer in the neoclassical style. Shellac - Lac is produced by insects that secrete resin. Resin is collected from the small branches of trees and called “stick lac.” After cleaned it is called “seedlac.” Further refining creates shellac. Shellac is also the basis of French polish. Side-Hung Drawer - A groove in the side of the drawer allows it to move in and out as its weight is held by a rectangular piece of wood fixed to the inside of the chest. Splat - The section of the back of the chair between the upright supports. Splats can be in solid form, sometimes curved, pierced or carved. Stretcher - Stretchers are turned or squared pieces of timber that join the legs of chairs, tables, and cabinet stands. Stringing - Thin lines of contrasting wood inlaid around or between other veneers. Sunburst - Inlaid semicircles or radiating and differing timbers. Usually inlaid into the bottom drawer of a chest on chest during the walnut period. Thomas Chippendale - c. 1718–1789. Born in Ottley, Yorkshire, he published "The Gentleman & Cabinet-Maker's Director" in 1754. His premises were on St. Martins Lane, London, from where he conducted a large cabinet and furnishing business. Tripod Table - A table with a circular or square top, carved or with a gallery on a turned stem supported by three legs. Veneer - The method of decorating the exterior of furniture with a thin slice of a quality timber. Veneer cutting was a skill developed on the continent of Europe and became fashionable in England beginning around circa 1650. Veneer was originally cut by hand using a saw; later, during the 19th century it was cut by machine. Walnut - Walnut has been used for European furniture-making since the 16th century. A rich golden brown, it was valued by furniture makers in England beginning around circa 1650. Virginia walnut, also called black walnut or red walnut, was used as a substitute for mahogany, starting in 1730. Windsor Chair - Said to have originated from the Royal Windsor Forest, the greatest production of these chairs was around High Wycombe in Buckinghamshire. Made of ash, elm, or yew wood.